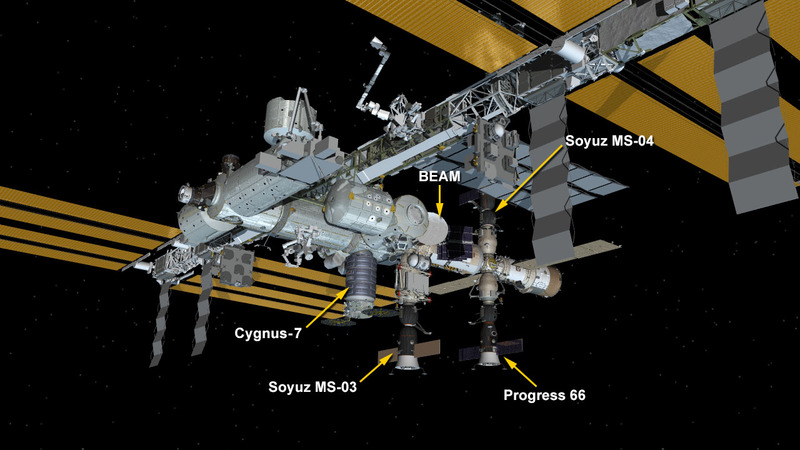 Four spacecraft are parked at the station including the Orbital ATK Cygnus resupply ship, the Progress 66 cargo craft and the Soyuz MS-03 and MS-04 crew vehicles. The Orbital ATK Cygnus cargo ship was bolted into place on the International Space Station’s Earth-facing port of the Unity module at 8:39 a.m. EDT. Crew will ingress the spacecraft later today. The spacecraft will spend about three months on station before it is released in July for a destructive re-entry into the Earth’s atmosphere, disposing of several thousand pounds of trash. In microgravity, cancer cells grow in 3-D, spheroid structures that closely resemble their form in the human body, enabling better tests for drug the efficacy. The ADCs in Microgravity investigation tests drugs designed as targeted cancer therapies called antibody-drug conjugates, developed by Oncolinx. The Solidification Using a Baffle in Sealed Ampoules (SUBSA) investigation originally was operated successfully aboard the station in 2002. Updated software, data acquisition, high definition video and communication interfaces will help advance understanding of the processes involved in semiconductor crystal growth. Investigations such as the CLYC Crystal Growth experiment will be conducted in the SUBSA Furnace and inserts. High-quality crystals are essential to a variety of applications, and a microgravity environment can produce better quality crystals. The Thermal Protection Material Flight Test and Reentry Data Collection (RED-Data2) investigation studies a new type of recording device that rides alongside a spacecraft as it reenters Earth’s atmosphere, recording data about the extreme conditions it encounters. Scientists, so far, have been unable to monitor those conditions on a large scale, and a better understanding could lead to more accurate spacecraft breakup predictions, better spacecraft designs, and materials capable of better resisting the extreme heat and pressure during the return to Earth. Prior to re-entry in late July, the Cygnus spacecraft will also host the third Spacecraft Fire Experiment, or SAFFIRE, to study how fire burns in microgravity. Data from these experiments will help inform the development of future crew spacecraft. Learn more about the Orbital ATK CRS-7 mission by going to the mission home page at: http://www.nasa.gov/orbitalatk. Join the conversation on Twitter by following @Space_Station. To subscribe or unsubscribe to this list, please email heo-pao@lists.nasa.gov. Are there any plans to continue additional construction to ISS? A new Russian module and a new international docking adapter will be installed on the station on a pair of upcoming missions. I soooo wish that the work and dedication of our astronauts and cosmonauts could be seen by a larger population than what we get on nasa stations. How come our media totally disregards all that they are contrbuting to the world “Off the earth, for the earth”? I am 84 years old and to this day, I have constantly been in awe of the hundreds of people at NASA, at cooperating corporations, to make our space launches– both cargo and human, such an inspiring experience. To me, it never gets old. I would love to see these launchings shown in schools, showing how the experiments being carried out in space are so important to our people and our earth. Make people realize that even the astro- and cosmo-nauts are using their bodies as experiments as well, so we can go further into space and open new horizons to the world. Who knows? Soon many of us may be living on other planets. Thank you NASA.